I was hooked when the Chinese [Change III ] had landed on the moon on 14 th December 2013 . The landing site was in the Mare Imbrium where the peculier landmarks or configurations of the ground were not stood at all, so it seems to me difficult to search the Landing site. Instead, I have established a plan as an attempting practice to search the Apollo 17 landing site that was issued in the S& T DEC. 2002 p118 or http://www.boulder.swri.edu/~durda/Apollo/landing_sites.html and for the first time I have flown there this night with my refractors …… the result is this a sketch. It took only 5 minuites to find out where there was with the aid of the one meter diameter paper MOON map of the Arizona University press , …. 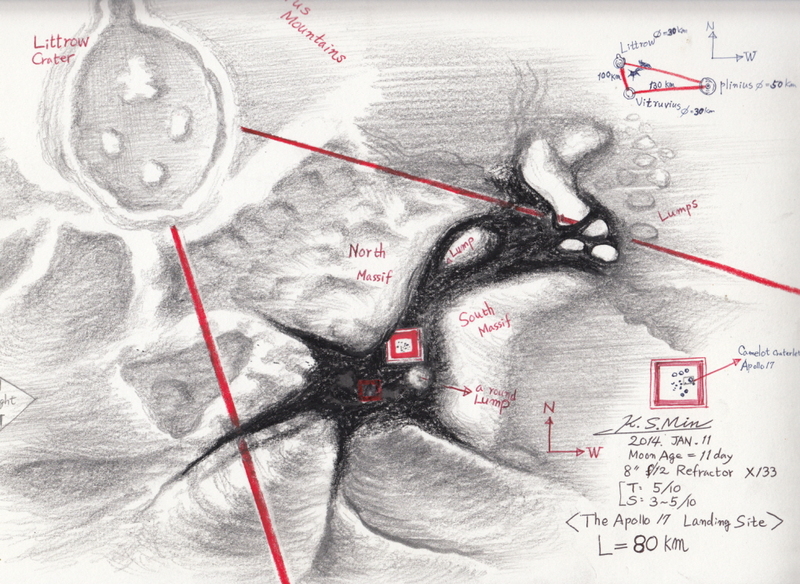 in the eyepieces, at first I have easily found out the three craters configuration as a red lined triangle marked in my sketch , but without enough previous study for the morphology of this place it was hard to find ” there” [Red lined box]. For the light gathering power of 8″ lens was weak I used only 133 magnification , further the 12″ lens was not adequate in this bad seeing.